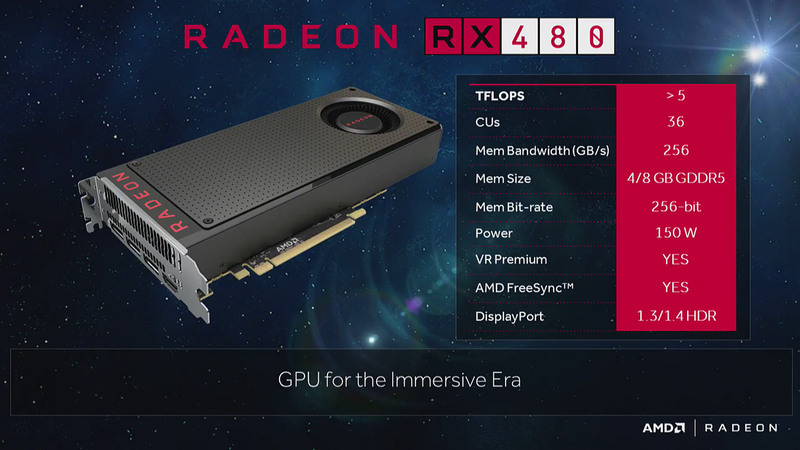 AMD has announced the Radeon RX 480. A graphics card set to provide millions of users with affordable, yet premium VR experience. The card is based on state of the art Polaris architecture, the first of its kind. And here’s the bombshell, it’s going to be retailed at $199 for the 4GB edition. But performance cards aren’t all that new, are they? After all, the Radeon 290x’s weren’t all that bad and they are/were affordable nonetheless. So what’s the deal with this new card? Well, it’s accessible VR. By the words of Mr. Raja Kudori, “AMD wants the quality of good VR but with the convenience of affordable VR”. What he means by that is the quality should not be compromised, but your wallet shouldn’t have a gaping hole through it either. So insane performance for an insane price? Pretty much. The 4 gig card can take on most cards in the present market for way less money. And the 8 gig version, priced at $229 will be an even bigger monstrosity. What’s certain now is that this is one of the best deals, if not the best deal in the computer market in a long long time. The 480x has the potential to become one of the most successful releases ever especially because it’s eclipsing anything and everything in contingence. Speaking of, the GTX 1080 was also announced recently as well. Its NVidia’s new flagship. That card costs more than twice that of the RX 480. In a performance comparison at Computex 2016, Mr. Raja Koduri showed two systems simultaneously running Ashes of Singularity. One system had the GTX 1080 and the other had 2 RX 480’s. Everything else was kept the same. The GTX 1080 costed $700 and the twin RX 480 was nearly $200 less. Yet, as it was shown, the X 480 performed better edging out a few extra frames and apparently not “sweating” as much. The GTX 1080 had to utilize nearly all of its power whereas the RX 480 was only needing 51% of its power. If you’re not into all the specifications, it basically means the RX 480 is offering flagship performance for a crazy-cheap price. All this is making for an exciting prospect in the tech market in the coming months. How it performs for the masses is yet to be seen. The card will go on sale on June 29th.